As Japanese beetles are spreading throughout Iowa and populations are increasing, more and more gardeners are dealing with these very hungry garden pests. Japanese beetle adults feed on a wide variety of plants. Their feeding damage is usually easy to distinguish from other leaf feeding insects because they do not eat the veins, leaving lacy-looking leaves. Japanese beetle adults are difficult to control and one way to limit the impact of adult beetle defoliation may be to select plants that the Japanese beetles tend to avoid. The following list of the Japanese beetle's most‑ and least‑favored woody plants may be useful to you if you are designing new landscapes. 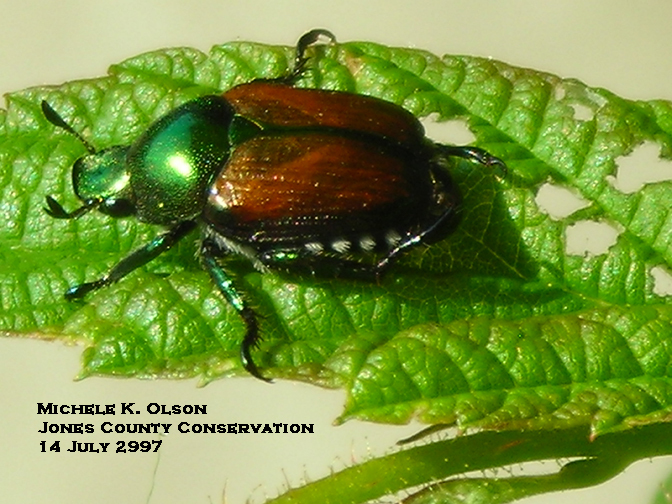 Least favored does not mean that Japanese beetles will not feed on them, just that they don't tend to feed as much. Interestingly ash are resistant, but we do not recommend planting them due to the emerald ash borer. Adult Japanese beetle. Photo by Michele Olson.